My comments on an intriguing TV series (only on Netflix), a famous painting and some Chicago news. My favorite winter screen find is this delightfully seamy, steamy political machination series, a Netflix original series. 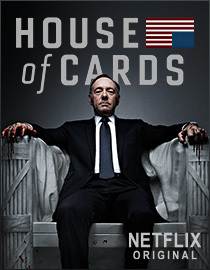 It stars Kevin Spacey as Frank Underwood, a South Carolina Congressman and the House Whip. (The Whip is the 3rd most powerful majority party position in the US House of Representatives. See, you can learn something reading this blog.) All 13 episodes are available now for streaming and they are juicy. Even better, however, is to also watch episodes of the original BBC series with the same title, also streaming on Netflix. The BBC version was first shown in 1990 and is set just after the Margaret Thatcher era. The neat thing is that the US version is patterned after the original. Ian Richardson plays Francis Urquhart, the Chief Whip in Parliament and an equally devious character. Both series feature a powerful wife and a young female journalist who is lacking a few scruples. Many of the characters track throughout and the plots track for the first couple of episodes. Now that I’ve seen four or five of each, the plots diverge somewhat . And both allow the leading character to break the “fourth wall” occasionally and speak directly to the audience. With a bit of snark and sarcasm. I’ve been alternating US with UK episodes and it’s fun to watch them that way. I don’t know why I didn’t watch the UK version before; it’s been in my Netflix queue for months. It’s very well done. If you’re a political junkie like me, you will want to devour them all at once. But just as I don’t let myself eat a whole pint of salted caramel butter pecan ice cream at one time, I’m spreading out the pleasure of watching House of Cards and House of Cards Redux. Streaming all episodes at once is Netflix’s attempt to feed the TV bingeing trend, made possible by DVD versions of whole seasons of popular series such as Breaking Bad, Mad Men and The Sopranos. Binge or one at a time, both of these shows are compelling television. 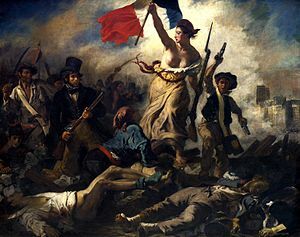 Ever since I saw Eugene Delacroix’s “Liberty Leading the People” in a baroque art class, I have loved it – for political as well as aesthetic reasons. BBC News reported last week that the painting was vandalized with graffiti while it was on display at a new branch of the Louvre Museum in Lens in northern France. Museum officials said that it appeared that the painting could be “easily cleaned” – it was and went back on display the next day. Delacroix painted Liberty in 1830 to commemorate that year’s July Revolution. Rick Kogan, a veteran Chicago journalist, is host of The Afternoon Shift, on WBEZ (Chicago Public Radio). He recently talked about his favorite place in Chicago, which is also one of mine. I paraphrase Rick’s comments. Kogan, whose father was Herman Kogan, a famous Chicago journalist, also mentioned his uncle Bernard. I had wondered what had happened to Bernard Kogan since I took my first Shakespeare course from him one summer at UIC on Navy Pier. I remember him as an inspiring professor who really made me appreciate the bard’s characters and language. I took this class during a summer term and we sometimes sat outside on the grass. Yes, there used to be grassy areas at the west end of Navy Pier, where it’s now all concrete. Bernard Kogan was also known for his writings on Darwin and on the Haymarket Riot. 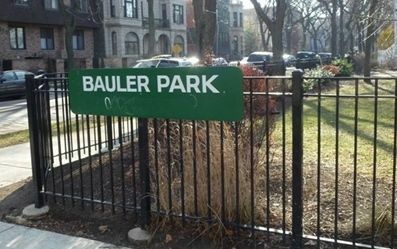 I also learned from Rick that his uncle earned the nickname Babe for his softball batting skills, playing in Humboldt Park.